"A great fighter for the freedom of nations and for democracy has died . . . His outstanding voice of wisdom will be missed in Europe, which is going through a serious crisis. I am praying for the peace of his soul"  Solidarity founder and Poland's former president Lech Walesa. "His peaceful resistance shook the foundations of an empire, exposed the emptiness of a repressive ideology, and proved that moral leadership is more powerful than any weapon. ... He also embodied the aspirations of half a continent that had been cut off by the Iron Curtain, and helped unleash tides of history that led to a united and democratic Europe."  U.S. President Barack Obama. "His dedication to freedom and democracy is as unforgotten as his great humanity . . . We Germans also have much to thank him for."  German Chancellor Angela Merkel, who grew up in East Germany and went into politics as communism crumbled. "No one of my generation will ever forget those powerful scenes from Wenceslas Square two decades ago. Havel led the Czech people out of tyranny. And he helped bring freedom and democracy to our entire continent. Europe owes Vaclav Havel a profound debt. Today his voice has fallen silent. But his example and the cause to which he devoted his life will live on"  British Prime Minister David Cameron. "The most subversive act of the playwright from Prague was telling the truth about tyranny. And when that truth finally triumphed, the people elected this dignified, charming, humble, determined man to lead their country. Unintimidated by threats, unchanged by political power, Vaclav Havel suffered much in the cause of freedom and became one of its greatest heroes."  Former U.S. President George W. Bush. "Amid the turbulence of modern Europe, his voice was the most consistent and compelling  endlessly searching for the best in himself and in each of us."  Former U.S. Secretary of State Madeleine K. Albright. "Havel was a brave and powerful voice against totalitarianism and an inspiration for dissidents everywhere struggling for freedom."  Israeli Prime Minister Benjamin Netanyahu. "He was a true European and has been a champion of democracy and liberty throughout his life . . . He was also a source of great inspiration to all those who fight for freedom and democracy around the world. The man has died but the legacy of his poems, plays and above all his ideas and personal example will remain alive for many generations to come."  European Commission President Jose Manuel Barroso. "With the death of Vaclav Havel, the Czech republic has lost one of its great patriots, France has lost a friend, and Europe has lost one of its wise men."  French President Nicolas Sarkozy. 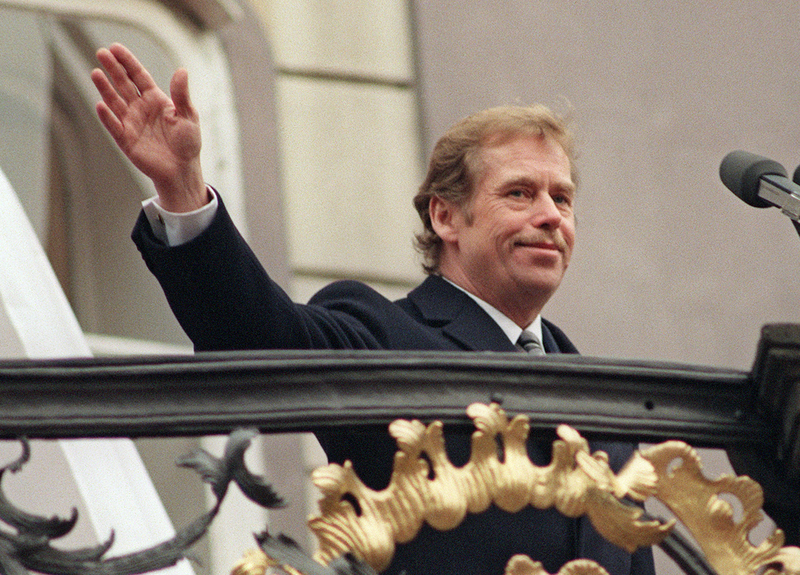 "Vaclav Havel is the figure that represents the Velvet Revolution and the reunification of Europe. He will be sorely missed."  Jerzy Buzek, president of European parliament and a former Polish prime minister and activist in Solidarity.